The University of New England and University of Tasmania are involved in a GRDC funded project attempting to develop wheat varieties which are resistant to Barley Yellow Dwarf Virus. Part of the project involves identifying the strains of BYDV which are present across Australia – there are possibly 4 or more strains present, some of which may not picked up by normal BYDV diagnostic tests. If you have crops affected by BYDV, could you please send in samples from the affected crops which you see. UNE will let you know the results of your samples once we identify the strains present. The results to date show that most people can identify BYDV infection in their crops, with only 2 of the crops tested not being infected with virus. The BYDV-pav strain is most commonly present in infected crops, while Cereal Yellow Dwarf Virus (CYDV-rpv strain) is much less common but still found in most areas. The project is still investigating which wheat varieties are tolerant to BYDV, and which virus strains have the most effect on yield. Please read carefully the full instructions for collection of plant samples in the expandable box below. These full instructions are also available as a pdf. Please also download and print the YD crop information form to complete and return with your samples. If you require this form in a different, more accessible format, please contact us for assistance. Collect tillers from wheat, barley, oats, or triticale crops at tillering (preferable) to early grain fill. 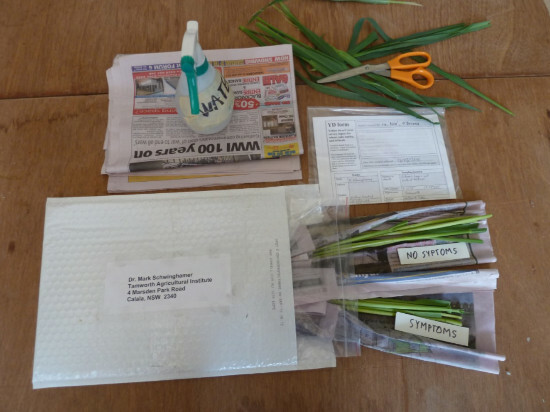 Collect samples from crops with yellow dwarf virus (YDV)-like symptoms including stunting, yellowing, or reddening commonly distributed in small or large patches of plants. Yellowing or reddening caused to YDVs is most pronounced at tips and margins of leaves. For each crop (cultivar/site combination) fill in a separate YD Form (attachment). Sender details or other duplicated information for crops can go on just one of the forms. Write your own reference (name or number) for the crop in top right of the form. I will cross reference it with my own YD number. Fold the forms and send them back in plastic bags with the samples. From each plant cut off one tiller near the base. Collect from a minimum of six symptomatic plants (for each distinguishable virus-like symptom) and six unsymptomatic plants from each crop. Unless only small areas are affected, plants sampled should be more than one metre apart. Unsymptomatic plants should come from near the symptomatic plants. Recently-formed tillers are preferable to the larger tillers on the plant. Base diameter less than 7 mm is desirable. Cut the tops and leaves off tillers, keeping the basal 20-30 cm. Peel off senescing or loose leaf sheaths. Note on the YD form (field at centre of front page) any aphids present and if possible identify them. Dark olive green to black oat aphids (Rhopalosipum padi) are common on tillers whereas pale green to yellow-green rose-grain aphids (Metopolophium dirhodum) are often on leaf blades and more difficult to see. Relatively elongated corn aphids (Rhopalosiphum maidis) may be on barley but are unlikely on other cereals. Before packing the trimmed/stripped tillers, manually crush and remove any aphids or other visible insects. Roll the symptomatic and non-symptomatic tillers in separately-labelled bundles in damp (not wet) newspaper or paper towel. I recommend using a hand sprayer to dampen the newspaper beforehand. Put both bundles in a plastic bag and pack inside a mailing bag or box with the completed YD form(s). To prevent the spread of Russian Wheat Aphid, please make sure there are no aphids on the tillers sent to us. Then double bag the samples before posting – place the wrapped samples inside a plastic bag and close securely, then repeat with another bag. Large ziplock bags are ideal, but a solid plastic bag can be closed by twisting the top and securing tightly with tape or rubber bands. Samples will be opened in a secure laboratory at UNE, and properly disposed of after blotting. Upon receipt, I will section and blot the tillers on nitrocellulose membranes. The membranes will be stored and used for YDV tissue blot immunoassays over several months. I will compile results of all tests and report back to you by the end of December. Contact me if you want to know results before then.